Background: In patients with frontotemporal dementia, it has been shown that brain atrophy occurs earliest in the anterior cingulate, insula and frontal lobes. We used visual rating scales to investigate whether identifying atrophy in these areas may be helpful in distinguishing symptomatic patients carrying different causal mutations in the microtubule-associated protein tau (MAPT), progranulin (GRN) and chromosome 9 open reading frame (C9ORF72) genes. We also analysed asymptomatic carriers to see whether it was possible to visually identify brain atrophy before the appearance of symptoms. 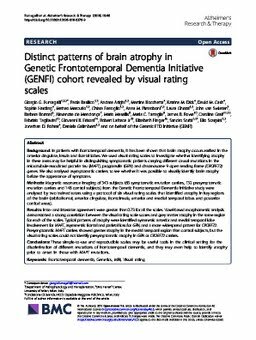 Methods: Magnetic resonance imaging of 343 subjects (63 symptomatic mutation carriers, 132 presymptomatic mutation carriers and 148 control subjects) from the Genetic Frontotemporal Dementia Initiative study were analysed by two trained raters using a protocol of six visual rating scales that identified atrophy in key regions of the brain (orbitofrontal, anterior cingulate, frontoinsula, anterior and medial temporal lobes and posterior cortical areas). Results: Intra- and interrater agreement were greater than 0.73 for all the scales. Voxel-based morphometric analysis demonstrated a strong correlation between the visual rating scale scores and grey matter atrophy in the same region for each of the scales. Typical patterns of atrophy were identified: symmetric anterior and medial temporal lobe involvement for MAPT, asymmetric frontal and parietal loss for GRN, and a more widespread pattern for C9ORF72. Presymptomatic MAPT carriers showed greater atrophy in the medial temporal region than control subjects, but the visual rating scales could not identify presymptomatic atrophy in GRN or C9ORF72 carriers. Conclusions: These simple-to-use and reproducible scales may be useful tools in the clinical setting for the discrimination of different mutations of frontotemporal dementia, and they may even help to identify atrophy prior to onset in those with MAPT mutations.